I am planning to climb Mt. Shasta this May. I've carried my D800 up Mt Whitney and a few other mountains, but those were trailed "hikes", not mountaineering. I also carried the D800 over 100 miles on foot through an African game park, so I am not shy about where I take the camera, but Shasta is snow, glaciers and ice with crampons and ice axes and I don't think a large camera on sling.or chest pack is going to be practical. I'm beginning to think a lighter and perhaps cheaper camera would be better. I would be interested in hearing about anyone's experience or suggestions with any of the smaller enthusiast cameras in such potentially harsh conditions. I tend to shoot primarily 20 and 28mm primes and a bit with my 85 if that helps. how much weight do you want to allow for the photo gear…all together including case if applicable? I would think this would determine the camera. If you need something small, tough and pocketable, I would say Nikon AW1. Interchangeable lenses and waterproof. Good for landscapes. No idea how much weight you'll be packing though. And note that the batteries will not enjoy low temps and their capacity will suffer. You want to pack those near your body to keep them warm. The smaller the better. Something that can be operated with thick gloves for sure. I'm not to worried about weight but bulk and portability are concerns. Of course IQ is key and i'd like enough resolution to allow cropping. The advantage to the D800 is i can shoot with the one or two WA lenses and crop to a 50mm FOV and still have a printable file size. i'd like to preserve as much of that cropability as possible. I'd also like a camera that was rugged enough to get banged around a bit and can be stuffed in a large jacket pocket or backpack pocket so it is available and not have to be swinging on a sling or in a chest pack that makes seeing the ground in front of me. It does not necessarily have to have interchangeable lenses, but that would be a plus. Waterproof is definitely over the top - snow doesn't get in a body. Thick gloves... would be nice, but in my experience, you can't handle a camera that way anyway. What you want is something you can take out of the pocket fast without taking off backpack and / or rope harness and all that. You have just discovered the very bid disadvantage of the D800 . It spoils you for anything else. The CoolPix A sounds like the perfect camera for such an adventure the 18.5 (28mm equiv) fixed lens, small size, plenty rugged, and 16mp will give room to crop. Sounds fun! Agreed. It's just an all around amazing camera. That's why I've been willing to haul it up mountains, but it really is just too heavy and bulky to be practical. One real problem is that none of the review sites discuss ruggedness - how soon will faux leather wrapping come off in snowy wet conditions? Will they take some banging around? There's a ton of information to cover to sort out lenses, overall IQ and usability for all of these, so any user experiences with these cameras would be appreciated. Is this a multiple day trip or a few hours? Shasta is normally a two-day hike I believe. I'd take a long hard look at the new Olympus OM-D E-M1. It has excellent picture quality, small and light (compared to a D800 setup), and has a rugged magnesium alloy body. The EM-1 is also slash-proof, dust-proof, and freeze-proof. Otherwise, maybe go with a good P&S, like the Sony RX100 MK2. I'd also pack a Go Pro. Yes, and I haven';t completely ruled them out, for their IQ and since I have a nice collection of glass for them. But I was hoping for something even smaller. A nice camera, but they're said to be essentially a ruggedized (which is very compelling) version of the J3 and I'm not a fan of the small sensor. But, you have got me thinking about it again. I really like the shock and water resistance. Hi all, Is this a multiple day trip or a few hours? We plan on being on the mountain for 3 days but possibly 4. It is very doable in 2, but I want the extra day for more sunrise/sunset opportunities and we may double summit via two routes - Avalanche Gulch and Casaval Ridge. I'd take a long hard look at the new Olympus OM-D E-M1. It has excellent picture quality, small and light (compared to a D800 setup), and has a rugged magnesium alloy body. The EM-1 is also slash-proof, dust-proof, and freeze-proof. We're taking a GoPro. I've looked at the EM1 and am very impressed. As for the 7100, and 3300, I jsut haven;t had a chance to handle them and see how much smaller and portable they are compared to the D800 (which is a beast, I know), and it's hard to not be compelled by the size, IQ and portability of the cameras such as the Fuji XE2 and Lumix GX7. I also just can't get my head around my second camera being a P&S, though I know I may not be objective. 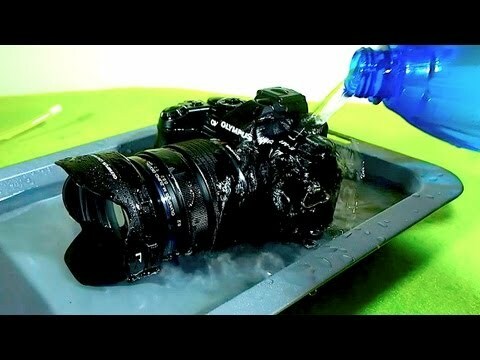 I would say go with the D800 and 1 or 2 lenses (your 20 and a nifty 50?).. you already have the go pro for documenting the trip .. .. just secure the D800 some where and only take it out when its "photo time". or get some serious gear to attach/secure the camera for easy access on your pack. seriously .. all it takes is 1 or 2 GREAT! photos and the pain of carrying a D800 will be worth it..
DX sensor I would go with the XE2 but the X100s and Coolpix A will probably suit your style..
1" sensor I would go with the RX100 .. or AW1. I've spent a long time out in the field on assignment and the more resilient and tougher the equipment is better off you'll be. That said, while I haven't climbed in snow, I've worked out in damn cold environments and trained the cold regions equipment team (US Army) where it gets below -40 a lot, but they have the luxury of warm up sheds and usually have had vehicle support. Their still photo equipment is typically Canon full frame gear, but they are brand agnostic. Generations ago, in covering combat I've walked miles in jungles for weeks (with resupply every few weeks). My load was near 80% of my body weight and every ounce seemed to just get heavier and heavier. Ade's suggestion, the Olympus OM-D E-M1, certainly looks really good. Nightfall will zap your batteries (and you). I would take more batteries that I thought I would ever, ever need and likely a backup camera of some kind, too. I don't recall seeing the 'purpose' of the images - what you propose doing with them. Remember that snow will go into the same pockets as the gear, regardless of how careful you are, and melt, so remember that when selecting your equipment. While all 'weatherproofing' can take a dowsing, all weatherproofing eventually fails. Probably not new or recently sealed, but sometime. The images will be primarily for printing up to 13x19 (my preferred size) for personal use with the possibility of very limited sale - I'm not a pro but I do sell a few prints and have had a few published. Though I do occasionally have pano's printed at up to 60". I'm very familiar with the "wet" aspects of winter mountaineering, though nearly all of my experience is on 14ers in Colorado, and a few years ago, and without camera gear. I agree it's the snow, along with the ice axe and crampon work, that adds complexity to the camera gear choice and I just don't think full sized DSLR is the best choice. I could never find a good solution for securing my D800 on my shoulder straps (Cotton Carrier strap shot), waist belt (various) or chest pack (Think Tank Digital Holster 20) that didn't either inhibit mobility or interfere with trail vision, though I can readily keep lenses in Lowepro hip/belt lens bags. Using a sling in the African Bush worked fine, but there were only dense Acacia to machete through (my guide/guard did the work) and steep gullies with leopards to deal with (my guard carried the weapons! ), but no technical work and we traveled light each day, so only a day bag. For mountaineering, we tend to backpack ~50-65# to base camps and summit with day bags. I decided that weatherproofing, size and IQ are my three determining factors. Based on that, if anyone cares, I decided to go with the Oly EM-5. The GX7 would have been my choice had it not been for the lack of weather proofing. Now to wait and see if the EM10 will be a lower model or a replacement for the EM5. I appreciate everyone's input and suggestion.